After more than a decade, the Apache RTR 160 has been comprehensively updated in 2018. 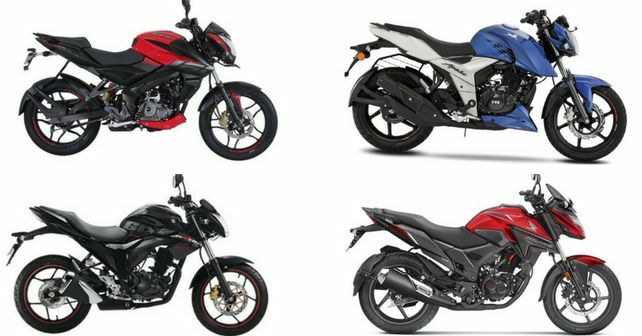 However, the 160cc bike segment is already crowded with capable contenders from Bajaj, Honda and Suzuki. We compare the new Apache RTR 160 4V with its rivals to see if it can hold its own. Much like the Pulsar NS160, the Apache 160 4V also looks a lot similar to its 200cc twin. This gives the bike a brand new, more upmarket design which many aspiring buyers will appreciate. The X-Blade is the the most striking bike of the lot with its sharp headlamp with a unique long windscreen. Its rear also has a sharp T-shaped light, however, the overall stance of the X-Blade is quite commuter-ish. If it’s a beefy 160cc bike you’re after, then the Gixxer should definitely be on your buying list - its muscular stance and wide rear tyre make it look more like a 200cc bike. Despite looking the beefiest, the Gixxer is also the lightest bike in this group at 135kg - the other three are more or less equally matched. The Gixxer will also has the lowest saddle height, which shorter riders will appreciate. Please keep in mind that Honda has not provided with an official figure of X-Blade’s seat height. The Apache RTR 160 4V is also available in a fuel-injected variant - but we’re only considering its carburetted variant here because the former elevates the bike’s cost. Producing 16.1bhp and 14.8Nm from its new 159.7cc motor, the RTR 160 4V is the most powerful bike in its segment. This is followed by the Pulsar NS160, which produces 15.3bhp and 14.6Nm. Both these bikes also sport oil cooling, which the Honda and Suzuki do not have. All bikes here come mated to a standard 5-speed gearbox. Disappointingly, none of these bikes are offered with ABS or CBS as standard. Also, the Gixxer is the only bike here that offers a rear disc brake in one of its variants. TVS offers rear disc in the Fi variant of the Apache, but the carburetted version only has to do with the front disc. Coming to the tyres, as previously mentioned, the Gixxer stands out here with the widest front and rear tyres which give it good street presence. The Pulsar and Apache have the narrowest rear tyres of this lot. All four motorcycles come fitted with telescopic forks up front and a monoshock setup at the back. At ₹81,502, the new Apache is the most expensive bike of this lot - but it also has the power to back it up. The Suzuki Gixxer offers the most flexibility as its offered in three variants. Both the Pulsar and X-Blade are only available in a single variant, with their prices evenly matched.